DTI Undersecretary Nora Terrado delivering a presentation during the 2018 Philippines-Korea Copyright Forum. 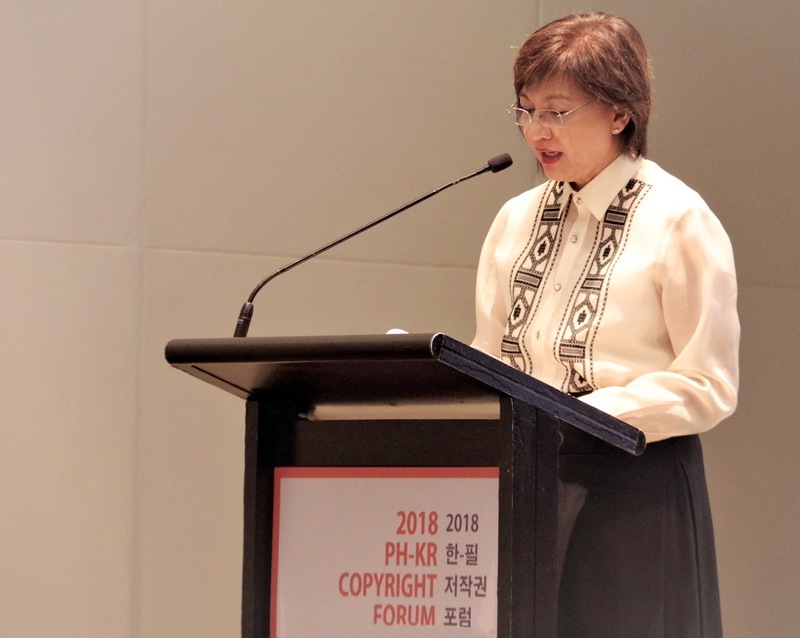 Trade and Industry Undersecretary Nora Terrado shared various implications of the fourth industrial revolution to trade and investments during the 2018 Philippines-Korea Copyright Forum held last 8 August 2018 in Makati City. “This revolution will disrupt status quo and will create new businesses – heralding the transformation of systems of production, management, and governance,” said Terrado. The forum, a joint initiative of the Intellectual Property Office of the Philippines and the Korea Copyright Commission, discussed various challenges at the onset of new technologies such as artificial intelligence (AI), big data, and the internet of things tagged collectively as part of the Fourth Industrial Revolution (4IR). As among the key speakers of the event, DTI Undersecretary Terrado discussed insights in coping with the various opportunities provided by the changing world and discussed initiatives of the government in assisting Philippine businesses and industries. Terrado cited the Global Innovation Index 2017 report which laid out areas of strength and improvement for the Philippines. Knowledge and technology outputs and business sophistication are two of the identified strengths of the country while areas of improvement include institutions, human capital and research, infrastructure, market sophistication, and creative outputs. She then noted as high in the discussions of strategies the observable change in consumer expectations which reflect the increased importance and emphasis on privacy, ownership, concepts of time and the changing modes of commerce. She further explained the roles of product and services enhancement, collaborative innovation, and organizational reforms. For DTI, Terrado cited the overall goals of building the innovation and entrepreneurship ecosystem, removing obstacles to growth, attracting more investments, strengthening domestic supply chains and deepening the country’s participation in regional and global value chains. She further discussed the Inclusive, Industrial, Innovation Strategy (i3s) being implemented by the Department of Trade and Industry as part of its efforts to transform the country’s economy in the new digital age. With i3s, DTI aims to present new industrial policy, bolder trade policy, and intensive investment promotion initiatives. Meanwhile, IPOPHL mentioned in a published release that the 4th IR is an opportunity in making the administration of intellectual property more efficient. As patent information and libraries are being digitized, AI can aid in search of prior art, and can be used as tools for patent examiners to speed up research; and to facilitate litigation for IP cases. “From the software, to the actual device carrying the software, to the business created from it, intellectual property can come in in terms of copyright, or patent, or a trademark. IP will be at the center of this 4th Industrial Revolution,” said IPOPHL Director General Josephine R. Santiago.